Many in the ad world think of “Madison Avenue” -- as defined by the big agency holding companies -- as representing a critical mass of the industry, but a back of the envelope analysis by Research Intelligencer analysis of some current industry estimates shows that the Big 5 (WPP, Omnicom, Publicis, Interpublic and Dentsu) represent roughly half of all advertising and marketing spending. Our calculation was derived by adding recently reported 2017 revenues for the five holding companies ($56.096 billion) and factoring them by a multiple of 10 to project gross billings of roughly $570 billion. 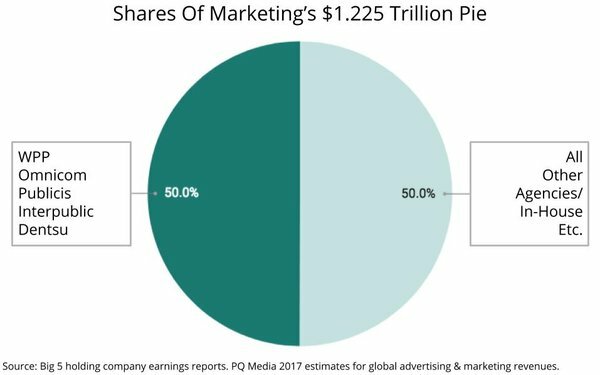 That’s just about half of the $1.225 trillion that PQ Media estimates global advertising and marketing revenues amounted to in 2017 -- indicating that much of the ad industry still is a long-tail marketplace comprised of smaller marketing and advertising services agencies, or handled in-house. It’s hard to say what the absolute trend line has been for Madison Avenue’s share of total marketing spending, but if recent patterns are any indication, they may be losing share. Creative In-Housing: In-housing of creative is probably a more important factor than we have considered previously, as increasing numbers of marketers are establishing “content studios” to develop and distribute thousands of pieces of content to replace some of the traditional creative assets agencies were once solely responsible for. Media In-Housing: In-housing of media (media contracts in particular, with media execution less common) appears to be more common now vs. two or three years ago among the clients that agencies service, although the impact in any given year could likely be measured in tenths of percentage points. ZBB: Large brands are growing slower than they expect they should, often losing market share to smaller upstart brands or digital disruptors. One reaction has been to implement zero-based budgeting (ZBB) processes, which is having a disproportionate impact on agencies in some instances. Fee Compression / Enhanced Contract Scrutiny: Like-for-like fee compression has been a fact-of-life for agencies for many years. While it’s hard to say that its pace has increased, in the wake of the K2 transparency report, clients have generally tightened up contract language to have the effect of eliminating some of the ways in which agencies generated some of their revenues over the past decade. Digital Standardization: Digital media has historically required more labor and services to manage non-standardized and fragmented activities. Slowing growth of digital media spending among larger marketers and heightened reliance on two major media owners may be restraining related growth for agencies. New Competition: Competition with IT services and consulting firms probably doesn’t have a huge impact, but it might be having one measured in tenths of percentage points. Despite these headwinds, Wieser remains optimistic about the “entrepreneurial” spirit of agencies. “Combined, normal low single-digit growth should eventually return for the industry, although it will likely remain relatively tepid during 2018,” he predicts.